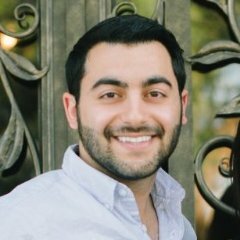 Editor’s Note: Sam Mazaheri is the former Director of Marketing & Product at AdStage, a cross-network advertising platform helping businesses manage all of their ad campaigns from one central place. AdStage is one of LinkedIn’s Certified Sponsored Content Partners. You can learn more about LinkedIn’s marketing partner program here. With the recent launch of LinkedIn Direct Sponsored Content, more advertisers are noticing the powerful audience targeting capabilities LinkedIn offers. As the only LinkedIn Certified Partner with access to both Text Ads & Sponsored Content, we at AdStage are privy to how best-in-class marketers target their ideal audience across the full suite of LinkedIn ad types. In this post, I’ll walk you through how to target your ideal audience using LinkedIn Direct Sponsored Content. Finding the right audience for your campaign is relatively simple: ask yourself who you’d like to engage. Is your target audience defined by geographic region, industry type, authority level, or other criteria? If your campaign is like most, you will use a combination of filters to define the various audiences you’d like to engage with personalized content. To help you quickly determine the most profitable target audience, Direct Sponsored Content allows you to run similar ads for multiple audiences. This in turn allows marketers to compare performance in real time and optimize campaigns on the fly. Targeting the right audience with your Direct Sponsored Content campaign is similar to other LinkedIn ad types. If you already have personas that characterize your target audience, you can leverage them for Direct Sponsored Content campaigns, especially if your persona includes work-related information, like job titles, as that’s the type of information you will use to target your audience with a LinkedIn campaign. For example, let’s say one of my personas is an IT Director at a company with fewer than 1,000 employees. I can easily reach this persona using the job title and company size filtering options. And now, with the ability to launch multivariate tests concurrently without barraging the Company Page with updates, marketers can quickly determine the most engaging content for each persona. LinkedIn’s audience targeting capabilities are second to none, especially for B2B advertisers. First, you’ll target your Location. Whether you choose a continent or a metro region, location targeting helps you focus your budget on the places where your customers are most likely to be. Next you’ll select the targeting options that define your audience professionally. Company - You can target your audience by entering specific company names or by defining the company size and industry. For example, if you are looking to target large software businesses, you may enter “Computer Software” and “Internet” as industries and “10,001+ employees” as company size. Job Title - You can target your audience by entering specific job titles or by defining the company job function and seniority. 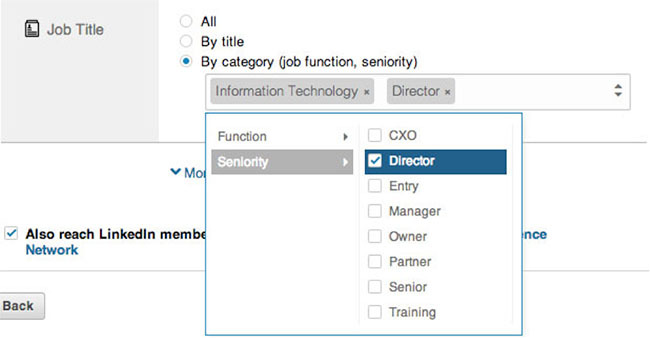 For example, you may enter “Information Technology” as the job function and “Director” as seniority. Skills - You can target your audience by the skills listed on their LinkedIn profile. For example, if you’re trying to reach online advertisers, you can enter “PPC,” “Google AdWords,” and “Online Advertising” as skills. Campaigns are the basic building blocks of LinkedIn Ads and LinkedIn Sponsored Content. Our customers create multiple campaigns that target the same persona. Creating multiple campaigns that target the same persona helps you cast a much wider net, which improves reach and helps assure you’re not missing out on valuable opportunities. As both campaigns run, you can compare performance and make the necessary adjustments. Do this for all the personas you’d like to engage. As mentioned earlier, a major benefit of Direct Sponsored Content is the ability to test messaging to determine what best engages your audience. Our customers have used a wide variety of messages and promotions in their Direct Sponsored Content campaigns. In some cases, messaging about price yielded better performance. In others, messaging about reliability resulted in higher quality clicks. Results vary depending on the advertiser and the audience, which is why testing each campaign will ultimately yield the best results. Ready to connect with your target audience via Direct Sponsored Content? Ask your LinkedIn account executive about using Direct Sponsored Content for your next campaign. If you’re new to LinkedIn Marketing Solutions, you can get started here. To learn how the AdStage Platform can help you manage your LinkedIn campaigns at scale, visit AdStage here. Your audience is on LinkedIn. And it’s never been easier to get your content in front of them. Market to who matters.